When it rains, it pours! Having finally made it to the Slanted Wall for my birthday the day before, I was lazing around my hotel room on a Sunday and expecting to have something simple for dinner. Instead, I ended up at another very chic Vietnamese food restaurant called Bong Su! Earlier in the day, I had briefly walked down for a brunch at the nearby Chevy's for a meal of sizzling chicken and shrimp fajitas. From my room on the 16th floor, I could see some kind of celebration for which they had cordoned off part of 2nd Street; there was much music, dancing and prancing going on the entire day. The day had been chilly throughout, but at 6 PM the sun finally came out and it seemed pleasant outside now. So, off I went expecting to discover some new place for dinner. As it turns out, I actually discovered this Vietnamese restaurant right around the corner, at 3rd Street and Folsom. Bong Su has an eye-catching and stylish decor. 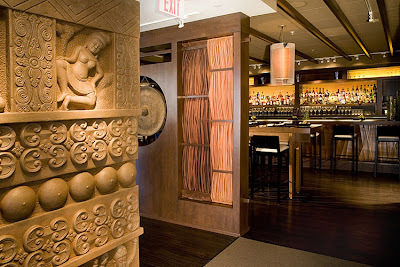 Sandstones figurines of Hindu Gods, dim lighting, smart hostesses and waiters all add to the elegance. Men will approve of the extra-slinky backless ensembles the hostesses wear. Let's just say no one with even a suggestion of love-handles will ever be hired as a hostess at Bong Su. The menu categorizes dishes into southern, central and northern Vietnamese dishes. Executive chef, Tammy Huynh blends traditional and the classical with local American ingredients and contemporary style. Along with her partner, Anne Le, they also own Tamarine in Silicon Valley which has earned rave reviews from the time it opened. I ordered a glass of Riesling and perused the menu. I finally decided to begin with the Nem Meatballs from Central Vietnam. These were grilled pork meatballs marinated in roasted rice powder and served with a chili-hoisin sauce. The starter went rather well with the Riesling. I then ordered the South Vietnamese Carmelized Black Cod, an Alaskan cod crusted with garlic, black pepper, molasses and onion. I ordered a side of coconut rice with it. The fish was absolutely delicious; so very most and flaky and very good with the sweet and pungent sauce. Please note though, that the portions are small here. For dessert, I asked my waitress for her favorite. Turns out that was a good idea. The Coconut Panna Cotta, with kaffir lime, mango, pineapple granite with mint and passion fruit reduction was very exotic and very delicious. As regular readers will notice, I don't have pictures of the food, like I usually always do. For once I didn't remember to take my camera along since I wasn't planning a special dinner. However, this is one place I am certain to return to! Too funny, like waiting for a bus. You wait for ever and 2 come at the same time! @beaverboosh: It certainly is! Heh.